“I had to stand there and watch while the rest of my life was determined by the shaky adhesion of a few millimetres of fractured ice and the dubious friction of a tiny point of metal in a hairline crack in a rock wall…”Marking the climax of his climbing career, Joe Simpson confronts his fears and mountaineering history in an assault on the North Face of the Eiger. Since hi“I had to stand there and watch while the rest of my life was determined by the shaky adhesion of a few millimetres of fractured ice and the dubious friction of a tiny point of metal in a hairline crack in a rock wall…”Marking the climax of his climbing career, Joe Simpson confronts his fears and mountaineering history in an assault on the North Face of the Eiger. 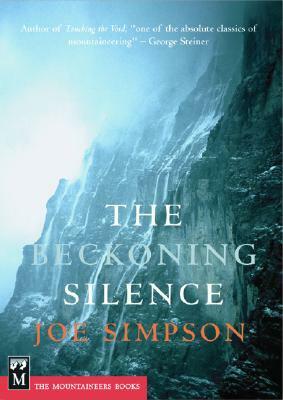 Since his epic battle for survival in the Andes, recounted in Touching the Void, Joe Simpson has experienced a life filled with adventure but marred by death. He has endured the painful attrition of climbing friends in accidents which call into question the perilously exhilarating activity to which he has devoted his whole life. Probability is inexorably closing in. The tragic loss of a close friend forces a momentous decision. It is time to turn his back on the mountains that he has loved. Never more alive than when most at risk, he has come to see a last climb on the mile-high North Face of the Eiger as the cathartic finale to his climbing career.In a narrative that takes the reader through extreme experiences from an avalanche in Bolivia, ice-climbing in the Alps and Colorado and paragliding in Spain -- before his final confrontation with the Eiger -- Simpson reveals the inner truth of climbing, exploring the power of the mind and the frailties of the body through intensely lived accounts of exhilaration and despair. The subject of his new book is the siren song of fear and his struggle to come to terms with it. A great book for climbers, many of the thoughts and ideas that Joe Simpson shares are mirroring my own convictions about fear, death, dreams and life in general. He just found the words to describe those things in a clear and distinctive way. I'm recommending this book to everyone who wants to understand me and my "selfish" inclination for the Mountain. Enjoyed this - not as much as Touching the Void - but a good ripping, teeth biting, neck chilling climbing book is as good as a holiday! Now back to reality! a differenza di quel trombone di Messner, Simpson è proprio molto simpatico e autoironico. Scorrevole e brillante, mi sta piacendo parecchio. Devo vederla di persona la nord dell'Eiger. Da sotto, tranquilli! Enjoyable read but I did get frustrated at the level of irrelevant detail in his retelling of events. I also felt it sort of finished a bit unfinished. We never find out if he and Ray go back to the Eiger together and finish what they started, which was a bit annoying. However, I liked the glimpse he gave into the climbing fraternity and his honesty about the growing fear he felt as he got older. I remain entertained by the way Simpson portrays his experiences in the extreme conditions of challenging mountains. His resilience post-injury, determination and narrative are excellent. Moutain ManThis is a follow up to the author's book about his ordeal when the rope was cut. In this book he describes his try on the North Face of the Eiger. He is older and has fears that he did not have before. A moving and intimate look into the mind and mindset of one of the truly great climbers of this or any generation. Perhaps others are technically more adept but none are able to describe the terrifyingly beautiful world of rock and ice with Simpson's clarity and candor. Amazing ! Soulful InsightJoe Simpson can tell a story. This one starts out a little dry and then he hooks you. He' one of those authors who will one moment make you laugh out loud then make you cry. He bares is soul many times in this book. You understand why he is drawn, yet fearful of the mountains. He is grateful to be able to write about his experiences , his travels and friendships. This mountaineer definitely reveals himself truly! By the author of Touching The Void, this book seemed to start out as a memoir of why this accomplished climber hung up the crampons, but then he got sucked back in to one last climb of the Nordwand. Most of the book was a rehash of Eiger history, but I skipped through it all because John Harlin did a better job of it with his book (and had a more compelling story of why he wanted to climb the North Face of the Eiger). Bottom line, not my favorite book ever.